David Pawson is well known to countless Christians as an outstanding Bible teacher and author. His teaching through television and other media is received by many millions around the world. He explains the meaning of the Bible clearly, encouraging Christians to go back to Scripture and consider its teaching for themselves. 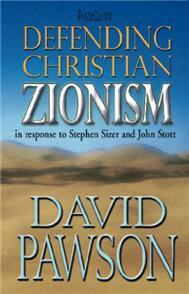 David Pawson answers the anti-Zionist writers who have attracted wide publicity recently. He addresses the arguments put forward by Stephen Sizer and John Stott, making it clear that believing in God's promises to Israel does not entail being a dispensationalist. Many other relevant issues receive attention, in particular a clear explanation of the nature of biblical covenant. This author occupies a key position amongst British Christian writers, with many high-volume titles in print, distributed worldwide. His clear, lively writing holds great appeal. His other titles include: Jesus Baptises in One Holy Spirit, Christianity Explained, Leadership is Male, The Road to Hell, Word and Spirit Together, Is John 3:16 the Gospel?, Why Does God Allow Natural Disasters?, Practising the Principles of Prayer, The God and the Gospel of Righteousness and Living in Hope.